Amazon Kindle: For instructions on moving a .pdf file to a Amazon Kindle e-reader, click here. Barnes and Noble Nook : To use the .pdf file on a Barnes and Noble Nook e-reader, click here. iBooks on iPad or other iOS devices: To use the .pdf file on an Apple iPad in iBooks, click here. 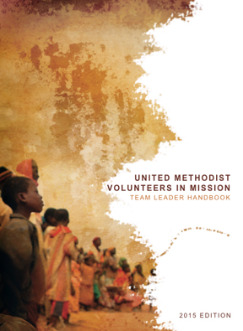 UMVIM, SEJ has written a handbook based on our 40+ years of involvement and experience in the short-term mission field, so that you, as the team leader, can lead a productive and educational mission journey that benefits both your team and those whom you are serving. In January 2015, we released an updated and revised editon of our handbook. We have structured this handbook around the process of forming and sending a team. If you are a seasoned team leader, you might already be familiar with some of the material discussed in the handbook. However, we have included information and tips we have received them from team leaders and long-term individual volunteers, and you will benefit from reading the handbook from start to finish. As always, if you have any questions about the process of forming or sending your team, please contact us. Please note: while this handbook supplements and is used as the main resource in Team Leader Training, it does not replace Team Leader Training coordinated through your annual conference or through the UMVIM, SEJ office. As a team leader, you are still expected to attend one of these training sessions.